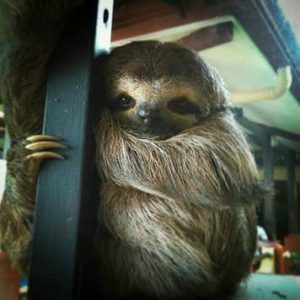 Costa Rica is a beautiful country that has managed to preserve its rainforests and parks, while offering ex-pats a place to buy an affordable home. It’s also country where it is easy for an ex-pat to own and run a business. For younger ex-pats who need to make a living, this is great news! Even for retirees or others with savings, owning a business is a perfect way to meet travelers from all over the world. 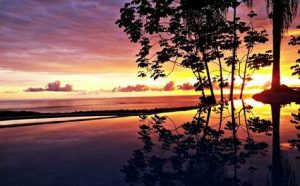 An opportunity hasncome up to actually own an established, profitable boutique hotel and restaurant with a stunning ocean view in southern Costa Rica. Just imagine the possibilities! 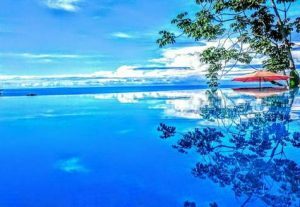 The hotel is located in Uvita and it flows over two acres of land with a breathtaking view of the coastline and the Whale’s Tail. It is a full service, four star boutique hotel. There are twenty different rooms for guests, each with private balconies, ocean views, and air conditioning. The rooms are located in two blocks, the upper block and the lower block. The upper block consists of twelve ocean view rooms on three levels; the lower block contains eight ocean and jungle view rooms on two levels. While both blocks boast ocean views, the ocean and sunset views are unparalleled from the upper block, while the rooms in the lower block are closer to the jungle canopy and are great for viewing wildlife, such as toucans and sloths. The hotel has a unique infinity pool that is fun for everyone. It was completely refurbished in 2015, with multiple levels, a water feature, and LED lights. Guests can enjoy the ocean view and amazing sunsets while lounging beside this incredible pool. Whale watching is a popular activity in the region, and guests might even be lucky enough to see whales or a pod of dolphins swimming off the coast! The hotel’s restaurant, located poolside, also has incredible ocean and Whale’s Tail views. It’s enjoyed by locals and hotel guests alike. With a combination of typical Costa Rican food and North American cuisine, everyone will find something to enjoy. There is also a bar and lounge located next to the pool and restaurant. The restaurant and bar add value to the purchase, as they provide separate sources of income for the owner and tap into a different market – the locals and ex-pats. The hotel and restaurant also have the capacity to host large events, such as weddings, conferences, business meetings, and retreats. 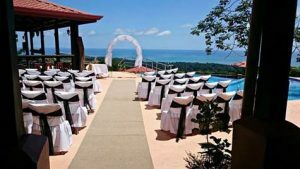 The poolside deck, with incredible views, is a stunning location for a wedding ceremony. There is also a banquet room which holds up to 100 people, and is perfect for business conferences, wedding receptions, and banquets of all kinds. The ability to host large events is another reason the hotel is popular and profitable. The location of the hotel makes it a perfect place for guests to call home while they explore the many wonders of Costa Rica. The Uvita area has so much to offer. Marino Ballena National Park, only five minutes from the hotel, has some of the most beautiful beaches in Costa Rica. If you’d like to get in the water, there are plenty of opportunities to surf, SUP, snorkel, SCUBA dive, or just swim and play in the waves. Other nearby attractions include stunning waterfalls, wildlife sanctuaries, and a horse ranch. Numerous tours can be arranged for guests, including rafting, canyoning, and zip-lining. With the commissions provided by tour operators for referrals, this can be another source of income for the hotel owner. There are also lots of amenities in Uvita, including banks, restaurants, grocery stores, doctors, yoga studios, salons, and a gym. Owning the Vista Ballena Hotel is a dream for anyone looking for a profitable business or boutique hotel in Costa Rica. You and your guests will love the beautiful scenery and the gorgeous ocean view from every room. You can watch the sunset from your personal balcony, or from the restaurant or bar. The ocean view is truly beautiful and it goes on forever. The hotel’s location, reputation, diverse sources of income, and ability to host large events will help ensure its profitability into the future. This is a special chance for anyone looking for a turn-key business opportunity in Costa Rica. Don’t let it pass you by – contact Dominical Real Estate for more information today!